Les joined fellow ex-athlete and motivational speaker Kriss Akabusi for the Sheffield to Birmingham leg of his Edinburgh to London charity bike ride. Kriss was riding to celebrate the 20th anniversary of breaking the British 400m hurdles record, and to raise money for children in Nigeria and Africa. The charity aims to help give children some of the things that we take for granted; somewhere warm to sleep, clean clothes, food and water, and opportunities to develop their minds. You can read about the ride on Kriss's blog. 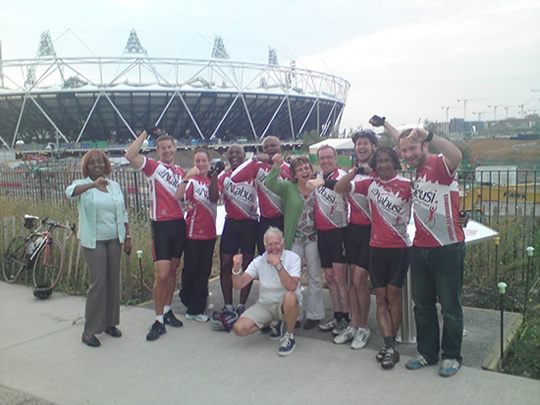 Kriss Akakbusi and his fellow cyclists at the Olympic Stadium, London, after completing their Edinburgh to London charity bike ride for the Akabusi Charitable Trust.